Each of our design consultants has over a decade of design experience. They are proven professionals with several of their kitchens being featured in publications including Washingtonian Magazine, Home & Design, and Bethesda Magazine. We are highly recommended by the top architects, builders, and interior designers in the Washington, DC metropolitan area. Since 1993, Kitchen and Bath Studios has created beautiful projects in thousands of luxury homes throughout Montgomery County, Maryland including: Bethesda, Chevy Chase, Potomac, Cabin John, Rockville, Kensington, and Silver Spring; as well as Annapolis, Washington, DC, Georgetown, Adams Morgan, Capitol Hill; and throughout Northern Virginia including: Arlington, Alexandria, Fairfax, Falls Church, Great Falls, McLean, and Vienna. Visit our showroom for a sample of our fabulous kitchen designs or call for an appointment with one of our designers. Our Chevy Chase showroom is convenient to Rockville, Silver Spring, Kensington, Potomac, Annapolis, Washington, DC; and areas throughout Northern Virginia, including Fairfax, Falls Church, Great Falls, Vienna, McLean, and Alexandria. We are eager to work with your contractor, builder, architect, or interior designer; and we can also recommend contractors. "I was initially impressed by the creativity you showed in dealing with a seemingly difficult space and the intelligence and sensitivity you showed in the original design... On paper, the design seemed excellent; in actuality is is superb." 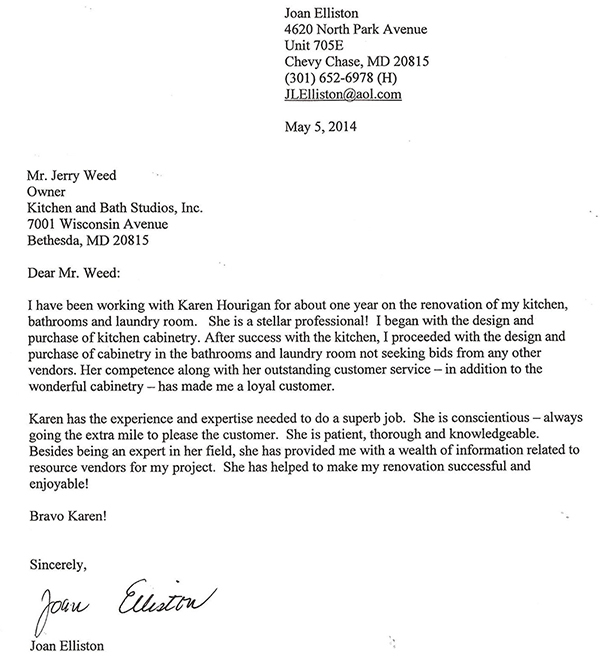 "After more than six years following the installation of the cupboards, I was very pleased that Kitchen & Bath Studios was still willing to provide important support." "I wanted to let you know how much I love my new kitchen!! It is incredibly beautiful and it all works so much better than my last apartment – where I spent so many years. As you know, there is much more storage – so that is really wonderful! But everything is also much more accessible for me and the various decisions we made work amazingly well. I appreciate all the thought and effort that was put into it – and know you appreciate as I do that much was made possible by Eugene and figuring out that the washer/dryer would and could be located side-by-side - and the many other adjustments to make things fit together. It was truly a great team effort and am more than thrilled with my place!! I definitely never dreamed I would have such a beautiful place and the kitchen is truly beyond anything I could have imagined." "I thought you might want to have feedback on the appliances for other people you might work with. I love the hood you selected over the cooktop. The lighting is a huge help and the fan is great. I can actually reach the controls but the remote is so nice for me to have and I use it all the time. At first I wasn’t sure I made the right choice with the Fisher and Paykel dishwashing drawer – that maybe a slim dishwasher would have been better. But, it was definitely the right choice for my situation. I love using it and it is a luxury to not have to wash dishes any longer – or at least not all the time! The Wolfe induction cook-top is amazing! It certainly is like gas – though it may even be better. Simple foods taste so much better with the induction. Needless to say, the oven is wonderful too! So with little effort, I am able to have great food and it’s wonderful to make dinners for friends now. Since the kitchen is such a wonderful place to be and right off the living area – the whole experience of entertaining is terrific and a vast improvement from my other place." "I also love the Asko washer and dryer! Some might think they are smaller but they don’t seem smaller to me. The magnetic doors with the cabinet covers work great. Again, such a pleasure to be able to reach the washer and dryer so easily and move clothes readily from one to the other. The refrigerator also works great for me. It's pretty large but the large door storage area is very convenient from an access standpoint. " "The drop down unit in the upper cabinet by the sink really did create a much more useable cabinet for me. Despite my use of the wheelchair, I am very able to store heavy cans and items on it and still be able to pull it down and push it back in place. I also love having the drop down ironing board which is a pleasure to use and the cabinet created a useful and attractive area covering the concrete pillar." "Everyone who sees the kitchen is blown away! Our management thinks it’s the most beautiful he’s seen in our 353 condominium building. I’m looking forward to you visiting again when you have the chance. Take care and thank you again for your work on my kitchen renovation. "